Cakes sure are fun to bake, but what if you’re not a fan of getting creative in the kitchen? 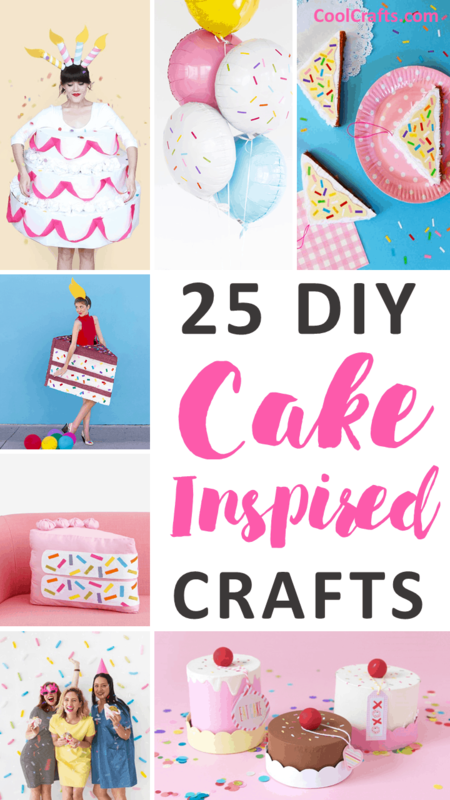 Today we’ve extended our love of all things cake to the craft world and included a round-up of 25 amazing cake inspired crafts that you can easily make yourself – no flour required! From gift boxes and balloons to cushions, jewelry, pinatas, and more – there’s just no stopping the imagination when it comes to craft projects inspired by this baked treat. Alana Jones-Mann has created these DIY cake boxes using paper mache – isn’t that wonderful? They’re both fun and easy to create. Here’s a DIY birthday centerpiece with a difference! A Subtle Revelry has painted some pumpkins to dress them up as birthday cakes. We think it’s a genius idea! Aww Sam is so talented that she created this DIY crochet cupcake beanie and wanted to share the tutorial and pattern with you! This would also make a cute gift. Here’s a cake inspired April Fool’s Day project that will be sure to get a few laughs! Aww Sam will show you how to create these fake sponge cakes to fool even the cleverest of guests. Fancy dressing up as a three-tiered birthday cake this Halloween? We couldn’t think of anything more fun (or delicious) to go as, so be sure to check out the full tutorial from Aww Sam! This would have to be one of our all-time favorite DIY cake inspired crafts! Aww Sam has created the most fabulous cake cushion and it’s sure to give you that birthday feeling, all year round. Damask Love has created these awesome DIY paper mache cake boxes and they’d make fantastic gift boxes for your loved ones! Want to recreate your own? You’ll love the full tutorial! Do you have a long-distance friend who can’t make it to your birthday party? Why not send them a faux slice of cake, along with a postcard attached to it? This genius DIY tutorial is brought to you by Delia Creates! We adore these DIY fairy bread cake piñatas and they come in miniature sizes for easy hanging! DIY Kiosk will show you how to create this fun and festive craft project. Dream a Little Bigger has created this Decoden Fake Cake Jewelry Box and we think it’d look awesome on a vanity table or dresser! It’s also large enough to store all of your favorite necklaces, bracelets, rings, or whatever else your heart desires! Here’s another fun cake inspired DIY craft you can whip-up this weekend, this time featuring a bangle from Epbot! We love its eye-catching sprinkles. Wow, Fimo Kawaii Emotions has created a strawberry shortcake inspired jewelry box via this YouTube tutorial! It almost looks good enough to eat. Is there any better way to wrap birthday presents than by making them look like an actual birthday cake? Handmade Charlotte has come up with this fantastic idea and we urge you to check out her full tutorial to see how you too can recreate this wrapping! Aww – what an adorable pupcake! Lovely Indeed didn’t want her pooch to miss out on the Halloween fun, so created this adorable cupcake costume for her. You can even bring cake sprinkles into your next birthday party’s décor, simply by creating this DIY sprinkle photo backdrop by Oh Happy Day. It’s certainly on our to-do list! Here’s an epic paper birthday cake box that will make anyone’s day! We love the amount of detail and dedication that Oh Happy Day has put into creating this DIY craft. Here’s some more birthday cake sprinkles, this time on balloons! 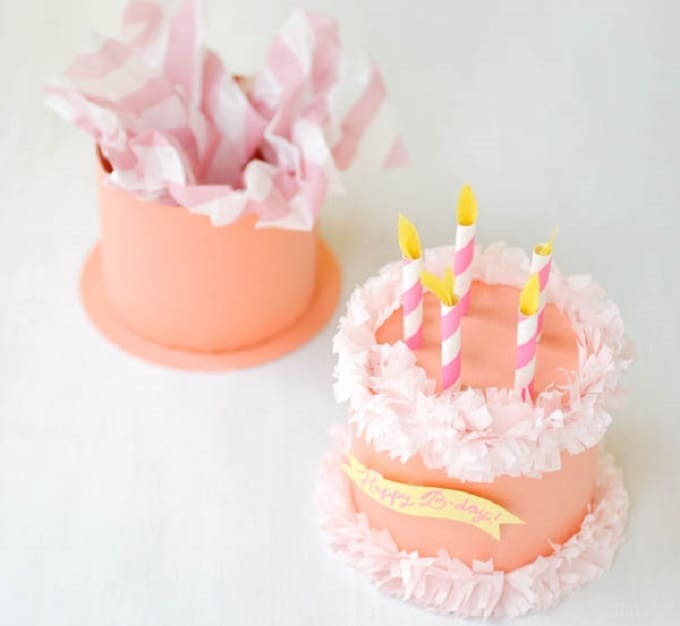 Studio DIY has created the ultimate birthday party craft project inspired by all things cake. Studio DIY has designed these printable coloring-in cake postcards for you! We love the fact that you can customize these in any way you see fit. The talented Studio DIY has created not one, but two DIY cake inspired Derby Day hats! Which one would you prefer to wear – the cake or lemon meringue hat? Studio DIY is a huge fan of cake inspired crafts, so she has also created a DIY cake slice piñata! This is nowhere near as tricky as it looks to make, so be sure to check out the step-by-step instructions. Speaking of all things cake (and Studio DIY’s love for them), here’s a cake Halloween costume that you’re sure to love! If you’re stuck for costume ideas, we definitely recommend that you give this one a go. Here’s a DIY birthday cake box with a twist – it comes in slice form! We love this colorful, joyous and cool creation from Studio DIY. Well, isn’t this one of the most adorable things you’ve ever seen? The Effortless Chic has made her daughter a DIY birthday cake costume for Halloween to celebrate one of the child’s most favorite things of all time. Toni Ellison has also created a miniature birthday cake using polymer clay and it looks amazing! You could even turn this into a necklace pendant or over-sized novelty ring. There you have it – 25 amazing cake inspired DIY crafts that you’re sure to love! Which ones will you be recreating? We’d love to hear from you in the comments section below!